This picture has very kindly been provided by Lois Bekeris and is possibly the only picture of the camp in existence. The camp was originally established as a military encampment at the beginning of the war, manned, by the Lancashire Fusiliers before housing prisoners of war. 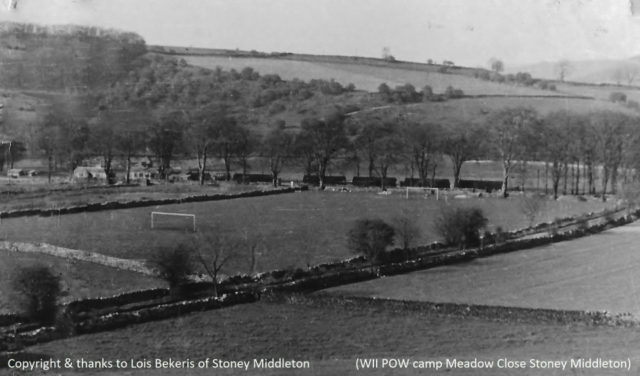 The camp was built on land between Middleton Hall and Calver, now the Meadow Close development. We lived at 16 Meadow Close, we had a beech tree in the garden, there was some sort of wire with a metal disc attached to it, my dad said it was for the telephone wire to run through, for the camp.